As one of the main principles on which the organization was founded is to generate and advance a spirit of understanding among Cubans and all the peoples of the world, the Club Civico Cubano offers scholarships ,full membership ,without distinction ,to individuals of all nationalities, races and ethnic groups that take an active interest in the civic ,cultural social and moral welfare of the Cuban Community. As such, subject to the provisions of the by-laws ,any person of legal majority ,good moral character and good reputation in his/her community may be granted membership in the Club Civico Cubano. Wherever the male noun or pronoun presently appears in the Club’s constitution and by-laws ,it shall be construed to denote both male and female individuals. All of us together will strive to promote the principles of good government and good citizenship in Cuba, the United States and around the world .All of us together will strive to promote the bonds of friendship, good fellowship and mutual understanding between persons of Cuban extraction of non-cubans. We shall strive to create an environment for the open discussion of all matters that are of public interest to the Cuban community ; provided , however ,that partisan politics and sectarian religion shall not be formally debated by club members . Our Executive Producer Dr.Adal .M.Hussain,Phd was honored by the Club Civico Cubano Organization and his president the Honorable Max Rodrigues. Citation by Nassau County Legislator Siela A.Bynoe as The Media Executive of The Year 2015”. 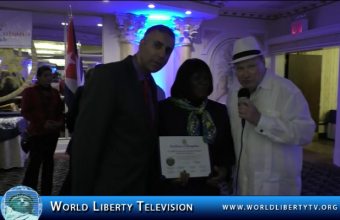 We want to thank Mr Max Rodrigues President of Club Civico Cubano and the whole selecting committee for bestowing this great honor on our Executive Producer and recognizing the great work World Liberty TV, does for all the communities , kindly watch the video and see many other wonderful people also honored on the same evening right here in our World Liberty TV, Humanitarian Channel. 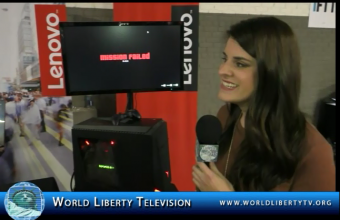 World Liberty TV, Team had the pleasure of doing reviews of some of the best products seen by our staff at the 2015 PDN Photo Plus Expo , see them right here in our World Liberty TV, Technology Review Channels. WatchTime Magazine, America’s best-selling and most influential media brand devoted to wristwatch collectors and enthusiasts, hosted its largest and most luxurious consumer event to date, WatchTime New York, on October 2015,at Manhattan’s elegant Gotham Hall. A star-studded assortment of more than 20 luxury watch brands, from internationally renowned manufacturers to up-and-coming independents, will exhibit their newest timepieces at the show — some of which will be on display in the U.S.A for the first time — offering guests the opportunity to see and try on watches as well as mingle with watch company executives, industry experts, and fellow watch aficionados. The event begin with a VIP cocktail party on Friday the 23rd, and continues with an all-day session the following day. Both days l featured presentations and Q&A opportunities with such luminaries as WatchTime editor-in-chief and veteran watch-industry journalist Joe Thompson; leading watch collector and brand consultant Jeff Kingston; and social media personality Anish Batt, founder of watch-and-lifestyle site WatchAnish.com. 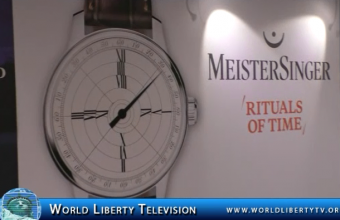 Several exhibiting brands will also have professional watchmakers plying their trade at work benches to educate consumers about the watchmaking process. 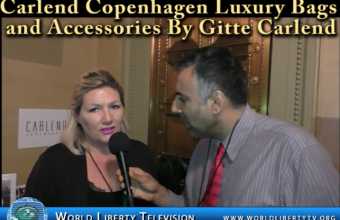 World Liberty TV, Team was on hand and spoke with the Publisher of Watch Time Magazine Sara Orlando, see what she had to say about this Luxury Watch event to our World Liberty TV, Luxury Channel Viewers. Attendees at this year’s show had direct access to more than 250 exhibitors and hundreds of new products and services offering the latest in imaging technology, software and accessories. With over 50 brands exhibiting for the first time at PhotoPlus, the number of exhibitors is at its highest point since 2010. At the Crystal Palace entrance, you was able to see New Product Showcase. Its the epicenter of innovation on the show floor. Companies debuting products this fall will have models basking in the gallery’s limelight. Visit the Theater, on the show floor, for a series of free 30-minute educational lectures designed to help attendees learn tips and tricks to take their photography to the next level. The PhotoPlus Theater had feature presenters from the most recognizable brand names in the industry and were free for all attendees to sit-in and enjoy. 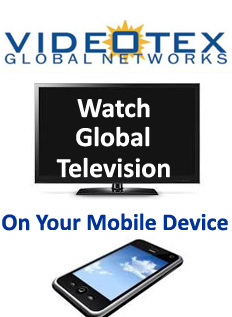 Explore the Newest Technology Out of East Asia! 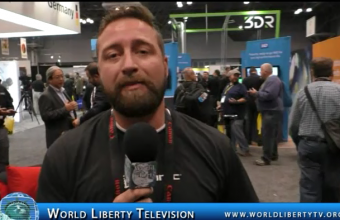 World Liberty TV,Team was on hand to meet and review the new products at the PDN Photo Plus Expo, see some of the newest products shown right here in our World Liberty TV, Product People Channel. Susan Lucci, star of “Devious Maids,” Emmy® award-winner for “All My Children,” New York Times best-selling author and entrepreneur; Tim Morehouse, Olympic Medalist, Fencing, & Founder, Fencing in the Schools; Dr. Gary A. Puckrein, President and Chief Executive Officer, National Minority Quality Forum; Ivan D. Smith, Partner, Hinshaw & Culbertson LLP; and Dr. John F. Williams, President, SUNY Downstate Medical Center, were each be honored at Sports Ball with the Leadership Award. Biopharmaceutical company AstraZeneca is also being honored for their global commitment to health and well-being. Dean Meminger, NY1 News Host and Cheryl Wills, award winning NY1 News Anchor and author, hosted the gala. The funds raised at Sports Ball support the Institute’s innovative community health education programs and research initiatives. 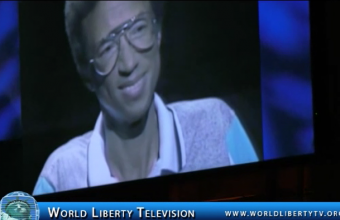 Arthur Ashe founded the Institute in 1992, in partnership with SUNY Downstate Medical Center, just two months before his death from AIDS and in response to the disproportionate amount of illness and death in urban communities from preventable causes. Arthur knew that many diseases, such as diabetes and hypertension, are the result of inadequate health care delivery, late detection and insufficient health education. Leading sponsors for Sports Ball 2015 include American Express, AstraZeneca, BNY Mellon, Healthfirst, Korn Ferry, MetLife and SUNY Downstate Medical Center. Each guest will receive a pair of Reebok sneakers compliments of the Institute. The evening includes interactive games, dinner, dancing, entertainment, an awards ceremony, and a silent auction. 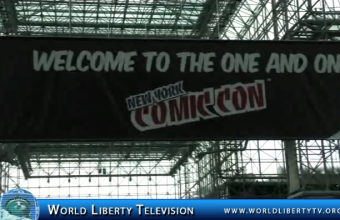 World Liberty TV,Team was on hand for the 6th time in covering this wonderful gala, see what Ruth C. Browne, CEO of The Arthur Ashe Institute for Urban Health had to say to our World Liberty TV, Humanitarian Channel . Public Relation was handled by the” Legendary” James Grant Public Relations, (JGPR). Think about the challenges your brand is facing today. Any savvy marketing or PR professional will tell you that they’ve changed a great deal in just the last few years. Securing press coverage is still critical to your success, perhaps even more so now that consumers are avoiding or simply tuning out most advertising. But to succeed today, brands must also find ways to meaningfully engage elusive, and increasingly influential, consumers. The reviews, recommendations, and opinions they’re sharing are more trusted than any other type of marketing communication and they’re more far-reaching than ever before. 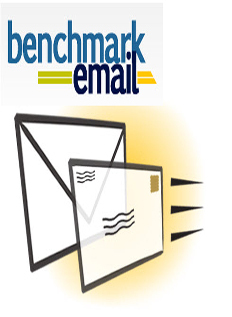 Turning these enthusiasts into word-of-mouth advocates is one sure way to get ahead of your competition. Brands today also must tell their own story by creating and publishing their own compelling content across the social web. In today’s world, we’re all publishers. That means finding and leveraging opportunities to create content that will resonate with your target consumers. What hasn’t changed are outdated, overpriced tech industry press events. They’re still charging you thousands of dollars and doing nothing to help you meet these new challenges. We created getgeeked to help brands meet all the difficult marketing and PR challenges they’re confronting today at one affordable event. For less than the cost of a typical press-only event, at getgeeked you’ll meet with all the same press you’re used to seeing at those events plus over a thousand influential consumers. Our press attendees represent the leading tech blogs, journalists focused on emerging tech categories like wearables and robotics, local print and broadcast outlets, as well as journalists covering lifestyle, health, education, and other areas where technology is having more and more of an impact. Getgeeked consumer attendees represent the savvy, influential tech enthusiasts that brands need to engage with. They’re early adopters of new technology and usually the “go to” person in their peer group for advice on what tech products to purchase. 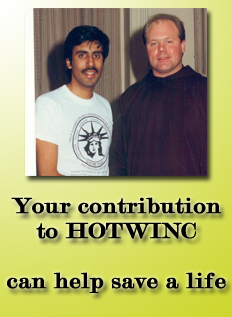 In short, they are the ones who have significant impact on which new products succeed and which don’t. 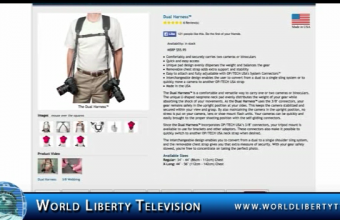 They are also some of the hardest consumers to reach. But they show up at getgeeked, eager and enthusiastic to meet with you. That’s what makes getgeeked unique, fresh and important for you to attend. 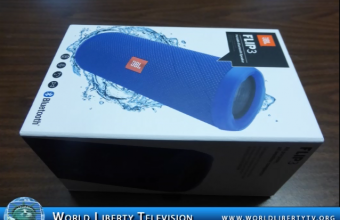 World Liberty TV, Tech Team was on hand to cover the Get Geek Event at Their new Location at the Brooklyn Expo Center, See the many vendors showcasing there Tech Gadgets and more right here in our World Liberty TV, Technology Channel. In 1965 he met in New York City Hispanic society with a visionary project to celebrate the exploits of Admiral Christopher Columbus, with a parade that will combine the spirit of the children of Hispanic America, and with a clear message Motherland Spain representing their culture, customs and folklore magnificent country of origin. This project was completed in August 1965, in which it was agreed to hold in the city of New York, which each year to October 12 next Sunday, a true celebration of Hispanic American spirit is celebrated. Since then is invariably organization has maintained its language culture and religion a directive of the parade of the hosts on their way through the streets of the Big Apple, and are the anxieties of this organization made up of 44 organizations and a directive on then were thirteen ombudsmen with a long and fruitful one calendar year. World Liberty TV,Team was on hand at The Gala called The 51 Years Celebration of Orgullo Nuestra Herencia Hispana, see more about this celebration right here in our World Liberty TV, Latino Channel. a leave, a flower, or the way light is reflected as it strikes a drop of dew. is the complexity within the simplicity. are part of and that we are relentlessly destroying. Destroying “Nature” is destroying ourselves! Graduated as an architect from Universidad Javeriana, Bogota, Colombia. Spain, France, Japan, China, among others. -The Washington Post, Washington DC. -Cesar Gaviria, private collection, Colombia and NY. -Equal Award, The Art league, Alexandria VA.
D.C. Commission for the Arts and Humanities, Washington, DC. -Award of Merit, the Neptune festival, Virginia Beach, VA.
-Honorable Mention, the Art League, Alexandria, VA.
-Medal of Merit Award, Ministry of Development, Bogota, Colombia. – Best in Show, First Stained Glass international Salon, Bogota, Colombia. -Honorable Mention, Salon del Fuego, Bogota, Colombia. -First Prize Architectural design for the Music Conservatory, Ibague Colombia. 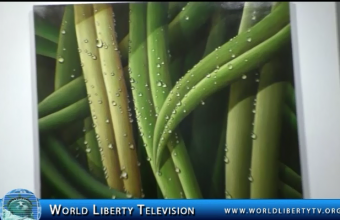 World Liberty TV, Team interviewed Mr Bernal at The Giving Back Foundation Annual Gala 2015, where Mr Bernal is a huge supporter of the Cause ,as well as donating his art for the cause. Mrs. Gandhi recently produced and directed an inspiring documentary; musical CD and coffee table book, all entitled Giving Back. “Giving Back: The Film,” includes touching vignettes of Meera’s prominent and not-so-prominent friends and illustrates how their philanthropic endeavors are indeed changing the world. Included are Cherie Blair, Kerry Kennedy, Patricia Velasquez, Kristi Yamaguchi, Steven Rockefeller, Francine Le Frak, Clodagh, Ronan Tynan, Deborah Norville, Narcisso Rodriguez and red carpet interviews with Bono and others. The film, book and CD have been introduced in eight cities since 2010: New York, London, Hong Kong, Mumbai, Delhi, Dublin, Paris and Istanbul. 100 percent of the proceeds from Meera Gandhi’s Giving Back project will go to charity.